This new version of GPU Caps Viewer is a maintenance release that brings the support of latest NVIDIA GeForce (GTX 980 Ti, GTX 900M series) and AMD Radeon graphics cards (R9 Fury X, R9/R7 300 family). GPU Shark can be directly launched (More GPU info button) in detailed mode to show additional GPU information (texture fillrate for example). + added Radeon R9 Fury X, R9 390X, R9 390, R9 380, R7 370, R7 360, R7 350 and R7 340 support. + added GeForce GTX 980 Ti. + added GeForce GTX 980M, GTX 970M, GTX 965M, GTX 960M and GTX 950M. + added GeForce GT 940M, GT 930M and GT 920M. 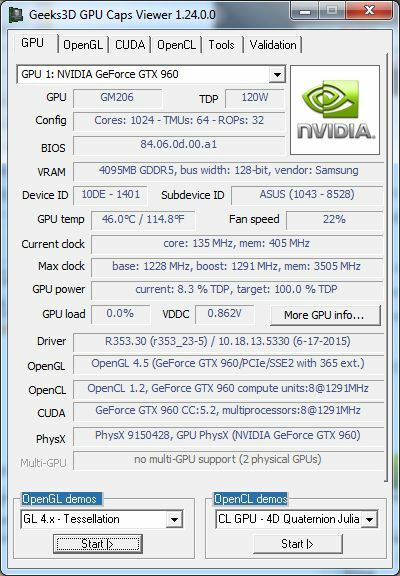 + added [More GPU info] button: GPU Shark is launched in detailed mode. Windows 10 is recognized as Vista (also in GLSL Hacker and GPU Shark). Julia is fixed in Geforce 353.62 (except under XP). 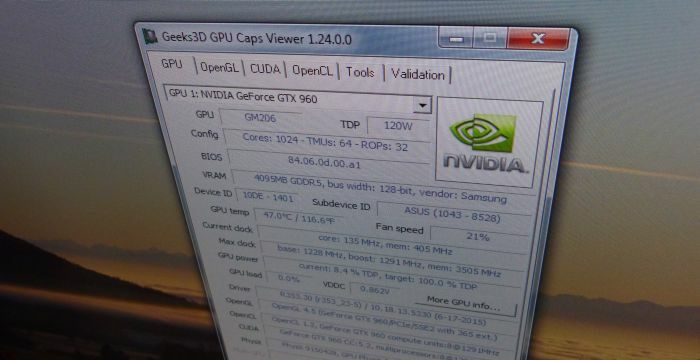 GPU reading is mashed on NVIDIA Optimus notebook.